Those of us who can stand to put up with a little mess here and there would all agree that a rat spotted in the house would be cause for alarm. And if you’re a neat-freak, you probably couldn’t eat or sleep if you had a rodent spreading bacteria and wreaking havoc in your home! The hard part is trapping and removing those filthy, squatting rats. But just because they’re out of the house, it doesn’t mean that the job is done. You’ve got to follow through with a thorough sanitizing and deep cleaning to make the rodent removal permanent and prevent future infestation. Have you ever found a bug on you, rapidly removed it, but couldn’t shake that awful, lingering skin-crawling feeling afterward? The only that really brings relief is a hot shower! Then you can finally feel clean. That’s why sanitizing your house is a must. Whether you’re a self-proclaimed clean-freak or not, disinfecting after rats and mice are removed will bring you peace of mind and restore your home safety. Ready to learn all the steps and tips for how to do a thorough disinfecting and sanitizing in your space? Put on some rubber gloves and prepare to get started! Dead rodents can cause a terrible stench! A foul odor is not just a nuisance, it can be a sign of danger. According to the Environmental Protection Agency, when breathed in, airborne contaminants and particles in foul odorous air can enter the lungs and bloodstream and can harm the lungs and the heart. They can even circulate throughout your house via the air ducts! The size of contaminating particles from the odor is directly related to their potential for doing harm and causing health problems. Unfortunately, we can’t measure what we can’t see. The average homeowner does not have the proper training or tools to do an odor removal job safely and thoroughly. The team at Green Rat Control specializes in Odor Removal services that make your home safer. They have all the professional-grade equipment to sanitize and deodorize your space, eliminating any and all dangerous airborne contaminants from rodent-infested areas, so you and your family can breathe easy again! Sometimes the damage caused by mice and rats is obvious but in other cases, it might go overlooked or present itself later. It’s easy to tell if mice shredded your attic insulation for nesting material, but insulation that has dried rodent urine would be harder to identify and the latter is just as damaging. Don’t take any chances! Sanitizing your house after the extermination ensures that your investment is protected. You won’t have serious problems such as mold, structural damage to wood, or decaying attic insulation developing months later. Deep cleaning right away removes any harmful trace of the pesky rodents. Be on your guard- rodents will try to get in again! But an immaculately clean space is not inviting, it’s not what they are attracted to. Sanitization removes the dust, dirt, and junk that rats and mice love to nest in. In a squeaky clean room, you’ll spot a single mouse dropping at first glance. There’ll be nowhere to hide, and nothing to sustain their appetite. 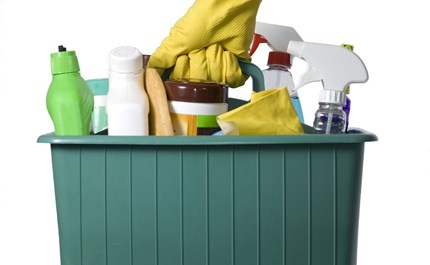 So although it feels like the last box to check off your rodent removal list, sanitizing is really the first proactive step you can take for successful future pest control. This list covers the bare minimum. Due to the serious health hazards involved, the specialists coverup from head to toe! The mouse droppings have got to go! Whether you plan to use a broom, dust mop, vacuum cleaner, (or all three!) you need to rethink your strategy. Scooping or sucking up of the rat poop will only get what’s visible. But in doing so, you will also stir up dust, accidentally release and spread microscopic bacteria and germs into the air- posing a risk of inhalation. Yikes! The U.S. Centers for Disease Control and Prevention (CDC) suggests you try this instead: soak rat nests, rat droppings, and any zones where rats have traveled with a strong disinfectant fluid that will kill germs on contact. If you can’t sweep it up, you’ve got to pick it up. (This is where the gloves really come in handy!) After you’ve soaked your infested area with a strong disinfectant, you can gather up all the debris and deposit them into a plastic bag. Clean any and all areas where you suspect they’ve been active. This includes checking all major furniture and appliances. Once all the rat poop, nesting material, and other hazards have been collected, double bag the trash, one bag inside the other, and tie them both tightly. The bags should be outdoors immediately and be picked up as soon after cleaning as possible. You can safely assume that rodents have infected every single surface in the space where they have nested and fed. Don’t neglect a single surface. Using disposable materials such as paper towels and a concoction of warm water and bleach, get to work scrubbing. Some materials are will be trickier to disinfect than others, like carpet for example. Who knows how many tiny, disgusting mouse droppings might have been ground into the carpet?? To disinfect carpets, upholstery and area rugs, shampoo or steam clean them. The heat and disinfectant solution together will kill any lingering bacteria. Successfully sanitizing after rodent extermination is a key part of keeping rodents out forever! You don’t want to be left wondering if you’ve done a good enough job. There’s just too much at stake- the health of your family, and the safety of your home, to name a few things. When it comes to home improvement, plumbing is best left to plumbers and wiring is best left to electricians. When you want the peace of mind and the guarantee that it’s done right, sanitizing after rat or mouse extermination is best left to the experts. Realistically, even with the best intentions and carefully laid plans, DIY projects can have their issues. You can avoid frustration, and wasting time and money and get the job done right the first time by hiring professionals. After all, the disinfecting cleanup process can take hours and hours depending on the size of space that was affected. Can’t you think of a better way you’d rather spend your time?? The team at Green Rat Control have been providing professional-grade sanitizing and dead rodent removal services for years. Go for full service- professional grade cleaning, and deodorizing to get rid of any lingering foul odors. You can feel safe and secure in your own home again after a job well done! Contact Green Rat Control today and make your house your own again! If I Have One Rat in My House, Are There More?